Jayla Walters isn't sure what to expect when her father's job uproots her and her brother, Dion, to Estes Park, Colorado. But right away, something doesn't seem right with their hotel. 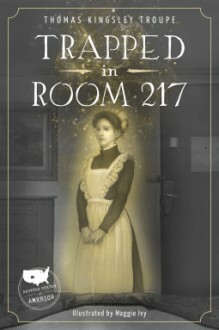 Jayla soon discovers that their home for the week, Room 217 of the Stanley Hotel, is the most haunted place in all of Colorado. Barely asleep the first night, Jayla watches a ghostly woman walk toward her bed. And the ghost visits her room every night. What does the ghost want? And what happens when Jayla and Dion get in her way? Every state has its own spine-tingling stories of ghosts and mysterious hauntings grounded in its regional history. The Haunted States of America series uses real-life ghost lore as jumping off points to new, chilling tales. But beware: sometimes real life is stranger than fiction.